Police dramas are hardly a rarity on British TV. Yet new BBC One series Good Cop, beginning on Thursday, attempts to put a fresh spin on an old formula. "A lot of police dramas lately have been procedure-based," explains writer Stephen Butchard, whose previous credits include 2011's acclaimed Five Daughters. "I wanted to pull it right back and root it in the human being." 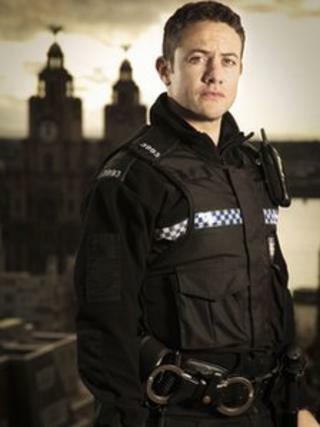 To that end, his latest work views the daily grind of Liverpool policing from the perspective of one man - PC John Paul Rocksavage, played by Warren Brown. "The attraction was to see it from a different point of view," says Butchard. "What I wanted was it to have a real tone about it." A "first responder" working on the Merseyside front line, PC Rocksavage - known as "Sav" to his friends - sees a lot as he is dispatched to attend to 999 calls. In the first episode, for example, he arrives at a dockside home to find a cot death waiting for him on the other side of the door. "I wasn't setting out to be gritty," Butchard continues. "But I think it needs to be shown for what it is. "He's a human being in a uniform, knocking on the door and not knowing what is behind it or what is coming." It is Sav's off-duty encounter with Noel Finch, a thuggish man whom he witnesses harassing a young waitress in a cafe, that sets the main drama in motion. Finch, played by Stephen Graham, takes exception when Sav intervenes and resolves to take revenge on the next policeman who crosses his path. What Finch does next has serious ramifications both for Rocksavage and his partner Andy Stockwell, played by Tom Hopper. Butchard is full of admiration for Graham's performance - one of several for a busy actor who was recently seen in BBC One's Accused and who also appears in BBC Two drama Parade's End. "It was fantastic of him to come and do it," says the writer. "We needed the kind of gravitas he could bring to it. "We didn't want an archetypal thug, but a man who bordered on the personification of evil." Brown, previously seen in Luther and Inside Man, describes Rocksavage as "a good cop who is forced into doing some bad things". "The opportunity to play such a complex character is something every actor dreams of," the actor continues. "I could feel for him and hopefully the audience will as well." Sympathetic viewers may be particularly taken by a scene in the first episode in which Rocksavage steps into the unwelcoming waters of Merseyside's Crosby Beach. "That was particularly cold," sighs Brown. "I have a tendency to film in the winter and this was no exception." More chilly work days could be on the cards for the Warrington native if Good Cop is extended beyond its initial four-episode run. "I would love it to come back," says Butchard. "There is a path forward. "But if it doesn't, there is satisfaction at the end." Good Cop begins on BBC One on 30 August at 21:00 BST.